You can create GrowFX within the panel Create > Geometry > Exlevel > GrowFX. 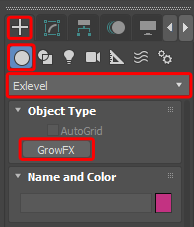 On the Create panel, click Geometry, choose Exlevel from the list and then click GrowFX. Drag in a viewport to set the center and size of the GrowFX icon. Allows you to open and save a model as a GrowFX file (.gfx). Displays the full path name of the *.gfx file. Randomly generates a new seed value. When on, the GrowFX object is not updated until you click the Update button. Note: The GrowFX object will be updated in any case when rendering is started. Allows to manage the list of paths. Makes a copy of the selected path into the copy buffer. Pastes the path from the copy buffer. Here you can move path items up and down by using the drag and drop feature. To the left of each path, you can see the bulb icons that allows to enable or disable paths. To the right of each path in the Paths list is an eye icon — a visibility toggle button. Simply clicking the eye icon hides the path (crossed out eye, denoting that this path is hidden). Click the crossed out eye to show the path again. Allows to customize settings for each path. Opens the optional parameters of Distributors. Opens the optional parameters of Direction Modifiers. Opens the optional parameters of Mesh Builders. Opens the optional parameters of After Mesh Modifiers. These settings can be used to set up the modes to display paths in Viewport. Activates "paths as lines" display mode in Viewport. The following parameters are available: Wire color, Percentage of paths, Show points of path, Show vectors of path, and the Show x-points of the paths. Activates the Mesh display mode in Viewport menu. Activates Highlighted paths mode. If the Lines mode is also active, the selected paths will be highlighted with the color specified in Highlighted lines color, in the Preference Parameters rollout, the other paths will be displayed in gray. If the Meshes mode is active, the selected paths will be additionally displayed as lines. Specifies the path color in Viewport, when the Lines is active. Specifies the percentage of visible lines in Viewport. Displays all points of current path in Viewport. Displays vectors directions and orientations of all path points. When on, knot points of a graph are displayed as x-points on lines in Viewport on modification of graph parameters. The system provides two ways to open additional panels, either by adding rollouts to the command panel, or in a separate floating window. This helps to divide different group parameters. So, Distributors path... button, Modify Direction... button, Mesh parameters... button and After Mesh Modifiers... button will open three separate floating windows. This can be customized in the Preference Parameters rollout. During the generation paths or meshes, the dialog with progress bar along with a Cancel button will appear after three seconds. Click the Cancel button to cancel the generation process. The progress bar does not always show the calculation timing correctly. Clicking the Cancel button will stop the process, and automatically turn on the Manual update on the Main parameters rollout, for the generation process are not started again.